In September 2014, the U.S. Fish and Wildlife Service (USFWS) announced that it would be conducting a review of the Red Wolf Recovery Program in eastern North Carolina, per request of the North Carolina Wildlife Resources Commission (NCWRC), to determine if the agency should continue, modify, or terminate the program that manages the last remaining wild red wolves on our planet. 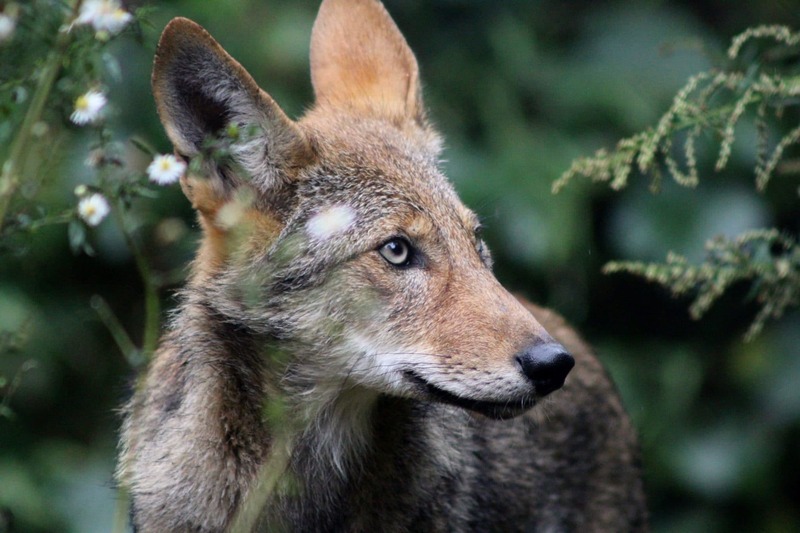 On Monday, September 12, 2016, USFWS published its long-awaited Red Wolf Program Review. The agency proposes a new rule that significantly changes the size, scope and management of the current red wolf recovery program. 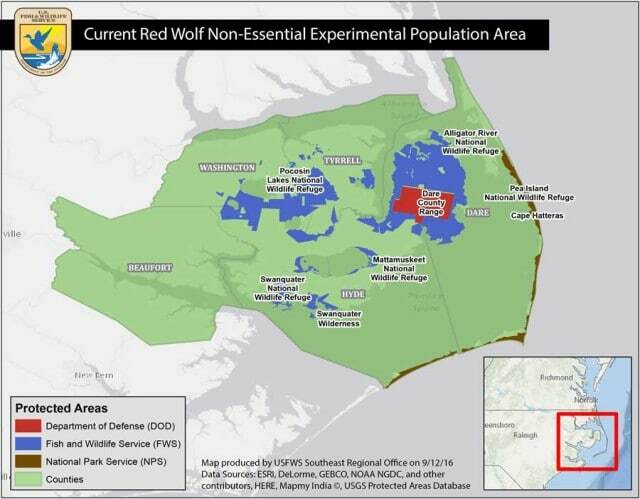 reduce the area wolves can roam from five counties to less than one by limiting red wolves to northeastern North Carolina’s Dare County Bombing Range and the nearby Alligator River National Wildlife Refuge as of December 2017 (see area shaded red on map below); wolves that stray beyond those boundaries would be captured and placed in a captive breeding program. recapture as many of the 45 wolves that presently remain in the wild by removing isolated packs of wild red wolves from private lands in several North Carolina counties near where they were reintroduced and place them in the single county within the Alligator River National Wildlife Refuge that has been targeted for that purpose. increase the captive breeding population of red wolves from 29 to 52 breeding pairs (or approximately 400 individual animals) with no definitive timeline as to if or when these wolves will ever be reintroduced to the wild. the decision will go through a public comment period and could be finalized by December 2017. In 2004, the Wolf Conservation Center joined the federal recovery effort via its acceptance into the Red Wolf Species Survival Plan and has played a critical role in preserving and protecting this imperiled species through carefully managed breeding and reintroduction. Red wolf reintroduction was among the first instances of a species, considered extinct in the wild, being re-established from a captive population. In many ways the red wolf program was the pilot program, serving as a model for subsequent canid reintroductions, particularly those of the Mexican gray wolf (Canis lupus baileyi) to the American Southwest and the gray wolf (Canis lupus) to the Yellowstone region. Red wolves are an American icon that makes our country’s wild lands whole and healthy. And the red wolf’s homecoming to America’s Southeast remained a significant milestone not only for the rare species but for endangered wildlife conservation. The wild population peaked at an estimated 130 wolves in 2006 and remained above 100 for several years. Data shows 15 or more wolves have died in each of the past 3 years from a variety of reasons including gunshot. It’s generally illegal to kill endangered animals. Unfortunately, in 2014 when USFWS halted all key management activity including captive-to-wild releases, the wild red wolf population plummeted to its lowest level in decades. Current estimates put the wild population at just 45 today. The value and importance of conserving species and ensuring biodiversity is an accepted axiom of the 21st century. The importance of a keystone predator such as the red wolf to a balanced and resilient ecosystem is undeniable. That our policies should be motivated by these basic scientific principles is a must. Please stay tuned for updates.